It immediately became one of his favorite toys. It's small enough for his little hands to grab, and lightweight enough for him to carry around with him. He loves pushing it around on the floor. One of his favorite things is to line up all of his vehicles in a line like a train and them from the rear. It's also surprisingly sturdy and durable. Anyone who has raised boys knows how tough they can be on their toys, but this race car is built to take everything he can dish out. He can bash it around, drop it on the tile floor, drop heavier toys on top of it; it takes it all with aplomb and keeps on going. Don't expect a great deal of attention to detail; this is a young child's toy. It doesn't have working gauges or a turning steering wheel or a trunk that opens or working headlights or anything like that. 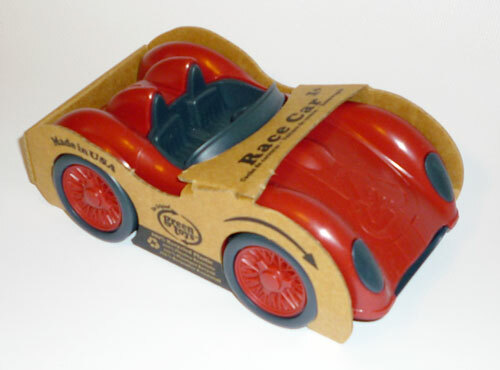 It's just a simple rolling toy in the shape of a bright red race car. There's plenty of time for fancier toys as he gets older. 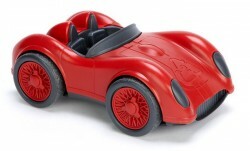 This one is just perfect for what it is: an affordable toy car for a young boy. Half a year later, it still has a prominent place among his growing collection of planes, trains and automobiles. And trucks. It cost me less than $9 from Amazon, with free Prime 2-day shipping. Green Toys Flat Bed Truck & Race Car, NIB, Fast Ship!